During a 3D photo or film shoot, 3D camera operators, stereographers, and 3D video editors work with two images or 2 streams of video which makeup the stereo image. Because they are working with a stereo image, there are limited methods in which they can view 3D footage while recording or editing. The Cinemizer is the perfect solution for both recording and editing. With its ability to adapt to most any stereoscopic input and block out ambient light, the Cinemizer will work with most any stereo camera as a reference monitor through the HDMI output. Editors using dual timelines can view stereo images as they are editing and can adjust their depth, convergence and parallax in real time and see how it appears in 3D. This can lead to significant time and cost savings in post-production. 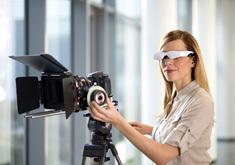 The cinemizer OLED can be connected to a DSLR camera via a digital HDMI or analog video interface to transform it into an electronic viewfinder. This allows you to assess the quality of an image anytime, anywhere and make changes to the camera settings – also via remote control. Blocking out ambient light enables you to view an image in the mobile glasses without being blinded by sunlight. Spectacular images from entirely new perspectives are created without forcing you into uncomfortable positions. For example, a camera can be mounted to a telescope arm to capture professional and spectacular images from a bird's eye view. "Amazing color quality and image depth. One of the most useful tools for shooting 3D"
"The most comfortable and versatile 3D glasses on the market"
"It cut my post production time down by at least 35%. A great time saver!" Do you have an idea or application in the photography or videography field where the Cinemizer could improve the quality and efficiency of production? Are you a photo or video studio and would like more information on how the Cinemizer could be used to make your workflow easier? 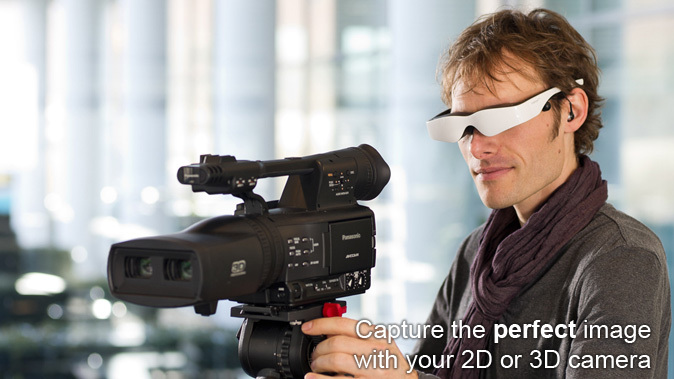 Are you a photographer, videographer or editor and are ready to purchase a Cinemizer and accessories ?